Baw Baw has an almost mythic reputation amongst cyclists as the hardest climb in Australia. 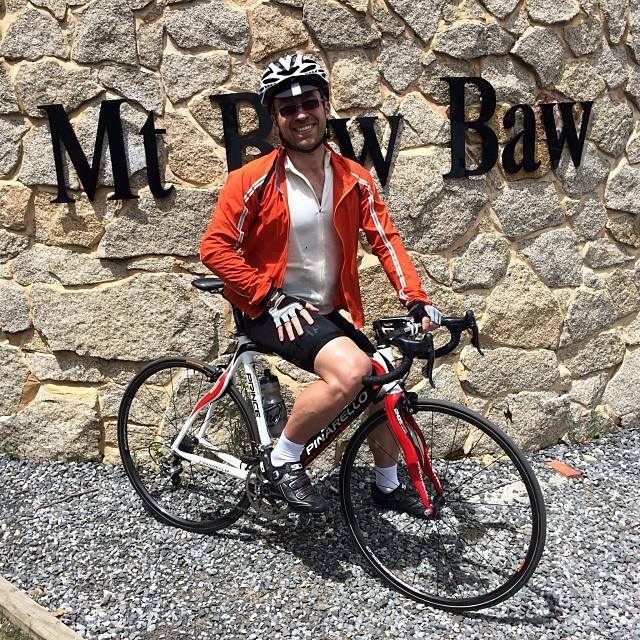 It earns this thanks to a 6.3km road leading up to the Mt Baw Baw ski resort which has an average gradient of over 11%, and rises approximately 700m. On this section the gradient only drops below 5% for the briefest of moments but it pinches at over 20% on one corner known as ‘Winch Corner’. Added to this is the lower section, another 6km with about 275m. So all up, you climb about 1000m in 12km. You can read a more detailed description here. I signed up to do this ride a couple of months ago as part of the Domestique Series, though to be honest I didn’t really seriously think I could do it. After the Alpine training camp my confidence a few weeks ago dropped much further. Logically I thought, if I struggled on Hotham and Tawonga how could I make it up Baw Baw which was meant to be much tougher. Well, on Sunday I brushed off the demons of doubt and conquered Mt. Baw Baw, and I loved it. 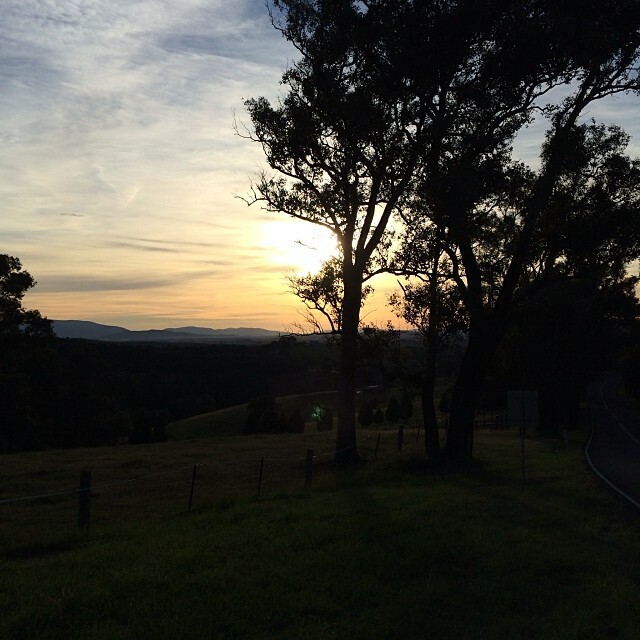 The day started with dawn ride, 20km to Warrandyte to meet up with Alex and Martin. The air was crisp and sweet with spring blossoms and the roads were quiet apart from a couple of other riders and a few cars. I left myself plenty of time so I didn’t have to rush. I even had to time to take a few snaps along the way. After a couple of hours we arrived at the little place called Tanjil Bren at the foot of the climb. 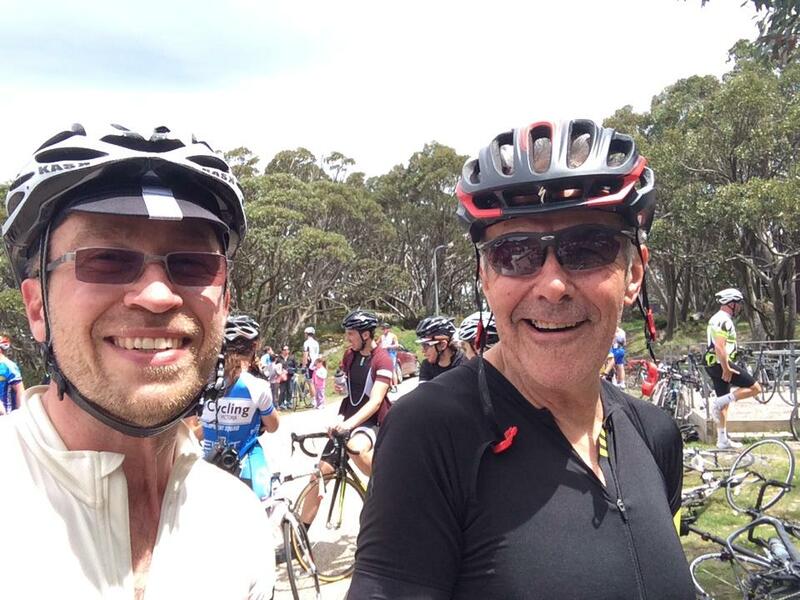 We had an hour or so to wait before the ride started and waiting around I started to feel some nerves creep in until I met up with Cyril who talked me through the strategy. He had already completed it once already that morning and was about to do it again. I’d never heard of anyone doing a repeat of Baw Baw. When the hard part of the climb started at the corner known as the ‘Gantry’ I was amazed to see so many riders getting off their bikes – standing, getting their breath. It was taking its toll early. On the advice of Cyril, I rode at a very easy pace for the first 5km of the climb, so when it came to the hard section I was still feeling fresh. This first section, though it’s almost equivalent to a climb like Kinglake, seems like nothing at all even at around 4%. I made a point of staying seated as much as I could, only standing for the steepest sections so as not to wear-out my legs too soon. For the steepest few kms I zig-zagged. I don’t normally do this, but I don’t normally ride Baw Baw. This proved a great move and I was able to keep a steady pace without feeling like I was overloading my legs or my heart. Most surprisingly, I found myself constantly passing other riders and this just made me feel stronger, probably because it gave me a sense of my own strength. 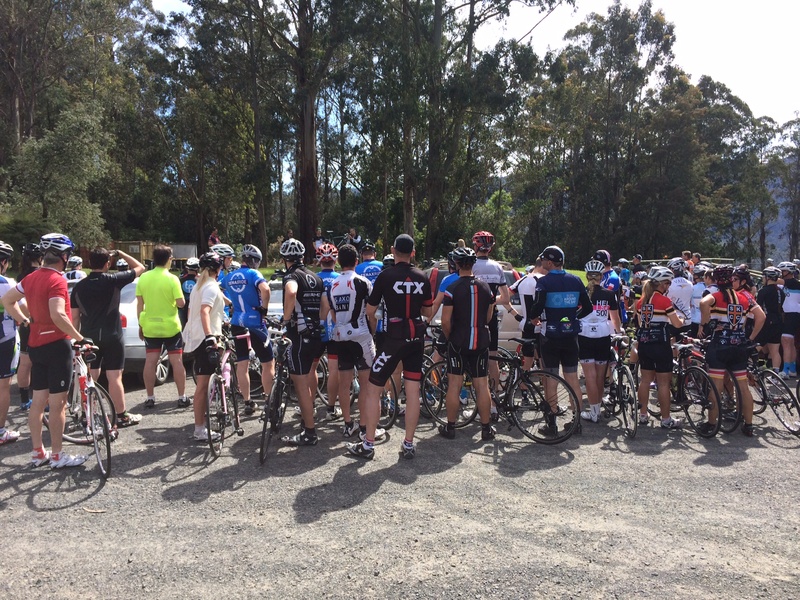 I had a similar experience a couple of weeks ago on Kinglake when I found myself in the midst of a big event ride. For most of these riders, Kinglake (which was my first big climb) was clearly a struggle, and the steep sections before and after it had people walking also. The main section of Baw Baw was hard, but at no point did I doubt whether I could do it, especially the way I was riding. It was great to be able to look back over the string of little choices I’d made over the last week knowing I’d made the right ones. One of the big things was a focus on recovery over mileage. I’m working on listening to my body, reminding myself that it’s in the time between rides that I develop my fitness. It’s about being flexible with my schedule to allow for recovery, but also being determined to train when the body is ready regardless of what the weather has in store. More than that though it was the mental preparation. All week I had calmly built up my determination and challenged my doubts. I was still nervous, but I kept this to a minimum. It felt like I was getting ready for an exam, but in a good way. I used to enjoy the disciplined preparation and cultivation of a peaceful relaxed mind before the event. I was also careful who I spent time around, avoiding people who might interfere with my state. On this occasion, I was looking forward to this test not simply as a bike ride but as an opportunity to learn about myself. Better still, I realised that even before I had clicked into my pedals I had already risen to the challenge. I think this realisation took some of the pressure off, while also making me more confident, which made it that bit easier to relax and just enjoy the experience, to be at one with it, rather than being focussed on the end. After 6km at an average of over 11% it was wonderful when the road started to level off at the approach to the village. I dug in and shifted up a few gears and put in a final push for the end, a sprint of sorts. It was a good thing too, because even though I’d forgotten about it, this meant that I came in under the 50 minute goal I had set myself for the main climb. There was a great atmosphere at the top, lots of shaking of hands and hearty congratulating, and photos. Then it was time to go down. I wasn’t really looking forward to this part, but I got down safely enough. A couple of others didn’t. Just before me one guy had come off and was in a lot of pain with a probable collar-bone break and a whack on the head which his helmet had taken the brunt of. I’m a very conservative descender, but it was a reminder none the less. And, that was that. A couple of days have passed but I’m still sort of in awe of myself. And I am sooo glad I didn’t listen to those doubts. So the Summer begins. In three weeks we return to Bright where I’ll have the chance to revisit Hotham and Buffalo while also riding up Falls Creek for the first time. And the reward… Dinner at Ginger Baker again. Can’t wait. Me and Alex, who had also just completed his first ascent. Thanks Jeremy and mega kudos on your amazing ride.